Jack Butala: Run From Professional Sales Trainers and Their Credit Card Limits. Every Single month we give away a property for free. It’s super simple to qualify. Two simple steps. Leave us your feedback for this podcast on iTunes and number two, get the free ebook at landacademy.com, you don’t even have to read it. Thanks for listening. Welcome to our show. 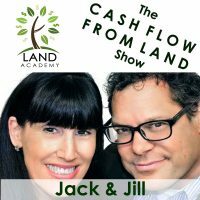 In this episode, Jill and I talk about how to run from professional sales trainers and credit card limit garbage. That’s not in the title, but I like saying garbage like that. Great show today, Jill. Before we start, let’s take a question posted by one of our members on SuccessPlant.com, our free online community. James, you’re awesome and yes we use both. As Data to Doorstep members, you get a free subscription to both. What? What? Yes, that’s new, that’s new, that’s new. I made a point about that. eTaxSales, yes. eTaxSale, it’s eTaxSales, by the way. It’s typed in here as eTaxSale, sorry. It’s sales. Anyway, yeah, I mean even the free version you can see how many properties are on the list. You can’t see any detail. It’s a fantastic way to find out because it’s one of the three ways to choose a county that we talk about in the program. If there’s a lot of back tax property, I’m not saying mail the back tax property like a lot of people do. Don’t do that right away. Mail everybody offers. I’m saying check to see if there’s a lot of back tax property in the area, and it’s a great indication about how the results of what if you mail everybody in the county after you scrub the data, anyway. Yes, the answer’s yes, it’s in our arsenal of tools. You know, I just thought of a great secret that I would like to share with everyone listening to this show. Oh my gosh, I’ve never heard you swear before. No, I’ve never heard you swear before. Ever. Hell’s not a bad word, is it? I’m pretty sure it’s a four letter word. I’m sure of it, actually. This mouth has been washed out with soap for the word hell. Yeah. It doesn’t make me want to say it. Anyway, I totally interrupted you. It’s okay. Here’s my thing. If you run across someone in your world who’s doing what you’re doing, aspiring to do what you’re doing, whatever it is, and they are convinced that the only way they’re going to win is just mailing out only people with tax default properties, whatever kind it is, let them go. They’re not in our world. They’re missing two thirds of the deals, and our job is not to convince them. We can just say, “That’s nice. Have a nice day,” while we’re over here killing it because they’re not hitting thousands and thousands and thousands of sellers that are now ours. Thank you. Or they might be the heir. Or they might think they own it. Their brother’s in Mexico. There’s a lot of problems. Wait, or they’re saying, “You’re going to give me $2,000,” and they’re quietly going, “He doesn’t even know I owe 3,000 on it. This is awesome. I’m going to get money out of it.” Do you really want … By the way, we’ve had this all the time, you go through all your homework, you’ve spend I don’t know how many hours on the deal and you get to the last piece and you go, “Oh my gosh, I can’t take the title or the taxes are too high. That was a waste of my time.” Yeah. Does it work, some version of it? Heck yes, it always works. If you send mail out to any person who owns real estate and it’s rationally priced and you do your homework, you have the right data, some version of it’s going to work all the time. You know, once you get into this, after a few mailers you want to be smart about it and mail the right people the right product and the whole thing. I’m not knocking mailing back taxes. Just don’t do only back taxes. Keep them in your mitts. That’s it. Don’t focus on just that, do everybody. That’s the main thing. Why are we just doing one group? Do them all. If you have a question or you want to be on the show, call 800-725-8816. Today’s topic, which is the meat of the show, is run from professional sales trainers and their credit card limits. Jill, give us some back story, background, on what this is all about because we have multiple members who call us before they’re members and say, “I just went to the Hilton.” Go ahead, go ahead. Oh my gosh. You know, I have to say I’m just reading a comment. One of our members put in bigger pockets … Gosh, it was I don’t know how many weeks ago, but it was along these lines that the … You’re out there, you’re trying to learn this stuff, you’re trying to find the right people. Anyway, he got involved in an educational kind of group. I’m trying to be very politically correct here. You know what he said? Everything’s an upsell. He said, “I was on these calls that weren’t worth the money. People were telling me, ‘I’ll tell you off the air because I don’t want to share that with the group. '” I am not kidding. That’s what I’m saying. It’s actually in bigger pockets if you want to go look it up, everybody can. Who was it, Jill? Not the person who made the comment, but whose program? Was it one of our direct competitors? Yeah, and it really broke my heart. You know what’s interesting is I went … Here’s what’s really funny, I’m reading this comment, going, “This is horrible.” I was kind of doing some research for our show today, talking about these people that do this to people. They give you just 30% of the information and they’re going to hold back the other 70% and you’re going to pay for it, by the way. Well, boot camp, that gives it away. I know. Anyway, you’re going to show up at a boot camp or you’re going to have a mastermind call, by the way, we’re not going to give it all here. Wait, you’re going to pay $500 to apply and I might let you in my $30,000 group. What the heck is that? Anyway, okay, my point is … It was really starting a Hilton thing. I quickly went to look at the individual, Jack, who wrote this and I’m like … He’s in our group and he’s happily doing just great. Oh yeah, don’t just have one source of education anyway. Yes, exactly. You’re going to learn something from everybody. Jack and Jill should be one source. You should have other sources. Exactly. Like you just said the whole show though, you shouldn’t be somewhere where they’re telling you how to raise your credit card limit. You need to pay for this and you need to invest in that. When it’s a nebulous amount where there’s nothing that comes out of it, like if I’m paying for data, yeah I have to pay for data. I’m paying for mailers, yeah I got to pay for mailers. I mean, there’s things like that I got to pay for. That’s just part of it. 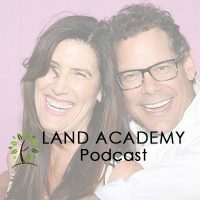 Jill and I, long before we ever started Land Academy, when it was just in its conversational stages, we promised each other that we would have one product and then provide the tools, and that’s what we do. We have one … We sell a product, an educational product, and then support tools for it, and then the rest of the stuff is free. Is it free-free? No, just exactly what you said. Incremental costs at cost. You have to pay for data downloads at our cost, and you have to pay to get stuff in the mail, you have to pay postage at cost or with a so we can keep the lights on margin. That’s it. There’s no upselling. No. Now I’ll give you the real stuff. That’s silly. You know what that is? Professional sales. That’s what this late night TV stuff is. They get you in the room for free and they charge you 50 grand or some number that’s silly. I have two things to say, too. You’re right. Our competitors are our greatest sales tool. I’m writing that down. That’s a show right there. That’s a good tweet here. All right. Let’s pause the show while we write stuff down. Everybody’s turning their radio off. Oh my gosh, you swore twice. I did. Oh my gosh, two. Two times in the same day. I mean, in the same lifetime. I know. Okay, so that’s number one. Then number two, Jack, here’s the bigger thing, not only are we providing the tools, but we provide them cheaper than anyone can get them. If I went out right now and got the same data we provide, I’d be paying … We were paying 275 a month, okay? If I went out and added eTaxSales, now I added like $30 a month. Then I wanted the other tax sale list, that’s another like $20 a month. Okay, so then I need … Don’t forget the mail stuff. Did you see it? I put it up there on our website. This isn’t a sales pitch. A thousand dollars a month of value? What am I getting? I mean, that’s the best thing because we’re doing it in numbers. We’re Costco. We’re Costco-ing it. If you went off the street and got all the products that are in Data to Doorstep, which we charge $198 a month for, it would cost 1,900 bucks. You get in a group with … You get in our group and people are … Everybody’s doing deals with each other. That’s a huge value, too. Exactly. I concur. Look at me. There’s a lot of people in this business buying and sell land and houses and stuff, and I’ll never understand this, there’s a lot of things in life to scrimp on from a money standpoint. Believe me, I am a cheap … The roots of sending out offers, lower price offers, the root of that is that I’m cheap. Maybe cheap’s not the right word. I’m frugal and conservative. There are a lot of people who just scrape the bottom, and they do it wrong. There are other data projects out there that are cheaper. They don’t work. Or they even get cheaper about it and go straight to the county, which there’s nothing wrong with but you need a PhD in data analysis to get the data. Which I almost have, by the way, and it frustrates even me. If there’s a place to save money, it’s not upfront with bad data and bad printing. That’s not the place to save money. You’re wasting money. Tell me about you had a deal review call with someone the other day an didn’t they tell you, oh my gosh, with Data to Doorstep data, I am getting … They were getting something crazy like a 30% return rate on their mail with some of the other data they were using. Wasn’t it like unable to … The addresses were wrong, something like that. Yes, yeah. You know what? Deal Review, by the way, is a product, again, is a product that you get with Data to Doorstep. It’s not free. Essentially, it’s a half hour phone call with me or Jill or both of us to kind of review the deal that you’re about to buy or sell or … I mean, how much money does that save? We’ve done almost 16,000 deals and I’m going to tell you straight out, personally, on Skype with a one-on-one call, whether or not you should be doing this deal. I love it. You look at maps with them, you look at, okay, let’s talk about this. That’s part of Data to Doorstep. Yeah, we review the whole situation. You tell them about the road, you talk about access, you talk about the area. We both look at, at the same time, not Jill and I but the person I’m reviewing the deal, at the same time we look up on the internet how to price it. Yeah. There you go. Tell me, what was the return rates? He said that 24/7, the mail return rate NSF … Not NSF, return to sender, the return to sender was 20%. How much does that waste? How much postage? That’s true. How much money? 20% of your … You’re spending a thousand dollars and 200 bucks of it was wasted on that mail. I am with you. It all taps into what we’re talking about. I don’t want this to sound like a sales pitch. I get mad about it. I know. It doesn’t happen very often. You know what’s really great? Thank you. I get mad about it and all of our members, you know who you are, who are listening right now, you have heard me on our weekly member calls, and if anybody’s messing with my people, I’m going to get mad, right? Mamma bear comes out. My people in our group, you guys come to us because you need something, we’re going to do our best to make it happen. If anybody messes, it’s kind of like a parental thing, yes. If anybody messes with my people, I’m going to get mad. Thank you. Hey, if you have any questions or you want to be on the show, call 800-725-8816. Jill, inspire us. Well, my inspiration today ties into this topic, which is please trust your gut instinct and don’t be swayed by a sales pitch. If you’re somewhere for free and it’s a seminar and next thing you know they’re asking you to buy this, pay for that, do this, pay for that, and it’s not sitting right with you, I’m not saying they’re all that way, but for whatever reason it’s like, “I don’t know. This doesn’t feel right. I don’t know if I should do this. Am I going to …” Then you go home and you lose sleep over it, it wasn’t the right thing. Being an entrepreneur involves a lot of self-study. If you expect somebody to stand in front of you even in a classroom or in a hotel whatever, lobby or conference room, and you expect someone to say some stuff and then all of a sudden you’re going to make money, that’s not how it works. This isn’t for you if that happens. There’s a tremendous amount of self-study and quiet time alone with the door closed figuring stuff out. We’re just here to provide the tools to have that happen and some education and guidance. There’s no magic wand. We’re not going to change your personality. That’s up to you. That’s true. Thank you, Jack. That was really awesome. The crap that Jack says. The crap that Jack says. Sometimes there’s good stuff. Just kidding. Sometimes it’s funny, sometimes it’s awful. Sometimes it’s bashing, something it’s nice. Sometimes it’s a rant. Hey, thank you for calling and this is the crap that Jack says show. We’re going to call it that. The crap that Jack says and the stuff that Jill puts up with show. Just kidding. I had a deal a week ago with a guy and he’s killing it. He’s just knocking it out of the park. After we were done, and it wasn’t one deal, it was like ten, after we were done, I said, “I got to ask you a question.” I said, “I’m a little frustrated because sometimes I don’t get through to members and sometimes I do. Maybe you can help me. What’s the difference? What is it about you that makes you knock it out of the park, and some people, they’re upset with their own performance.” He said it’s because it’s the why. I’m sorry, he said whys. I said, “Spell it,” and he said, “W-H-Y-S.” He said, “I’m constantly asking, why? How? Why? Why? How?” Asking himself, not me or you. He goes and he figures it out. Not W-I-S-E because I thought that’s what he meant at first. He’s just trying to get to the bottom of everything constantly. I think that’s at the root of being an entrepreneur. You know how we talk about deconstructing everything? Jill and I are here so that you can deconstruct our real estate entrepreneur career and reconstruct it for yourself, whatever version of it that is for you. You know what? This is topical. Wow, but you’re right. We set out to lay out for everybody to see, here’s how we got here. Now you take what you want from it. Here’s how to learn to find your own way, not you have to do this property and this type in this county. Maybe it’s apartment buildings in New York. I don’t know. The whole strategy works. Apartment buildings in New York, I like that. Maybe you want to have a transmission shop. Find somebody who’s got a successful one, deconstruct how they did it, where they got it, the whole thing, and then recreate it for yourself. I’m not saying walk in the same footsteps, I’m saying just whatever makes sense to you. That guy made it very clear. I guess I could use his name. It doesn’t matter. His name’s Tory. I have a lot of respect for the guy. He’s a good kid. Take a look at what he’s doing and deconstruct that. That’s another big benefit for what we do. We have these members. Maybe the Jack and Jill thing just doesn’t make a lot of sense to you, but wholesaling houses does. We have a ton of members that do that, too. Exactly. Since we’re talking about Tory, I’m going to ask Tory right now. Tory, I’m going to go to one of the events your wife does. We have some interesting members. It’s awesome. Even though we went way over on time on this show, get there first. That means the after talk probably should be really short. Good show. You know what? That whole show was after talk.